Our next Play that Paid Off comes nominated by Oliver Inwards (@oinwards), and boy did he select a great play to be broken down! Football is, of course, an intricately and meticulously planned sport, with coaches spending countless hours breaking down film to discover weaknesses and tendencies, and put even more into developing strategies and tactics to exploit them. Still, football is a sport, not a scientific experiment - you can craft plans all you want, but all it takes is a single unexpected action, or ill-executed assignment, to undo all that hard work. In those circumstances, the players on the field just have to wing it. 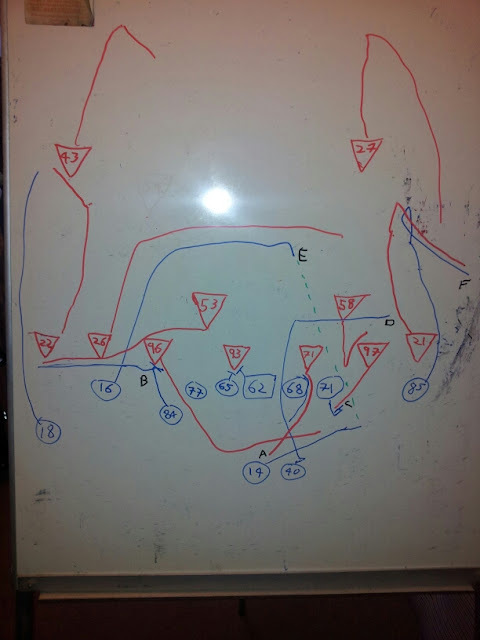 All of the plays we have broken down so far this season, with one exception, have been where the plays were executed successfully, as drawn up in the playbook. This time, thanks to Oliver's nomination, we're looking at a play that did not occur as planned, but rather one that quickly broke down; it gives us a chance to showcase how players can use their instincts and their recognition to not only salvage some good out of a broken play, but can actually make them even more successful than might have been originally hoped. You too can nominate a play to be broken down as one of our Five Plays that Paid Off. Just tweet a description of the play with the hashtag #TPL5plays, or alternatively you can nominate a play in our Facebook group. 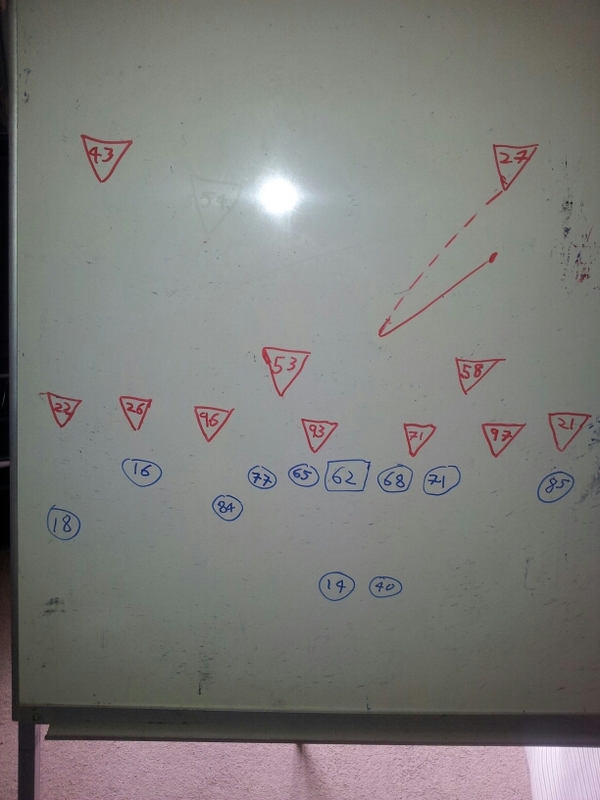 If we break down a play you nominate, you'll even get your name mentioned - just like Oliver has. Nice one Oliver! NB: approximate, not to scale, you know the drill by now! After the huddle: The Bengals line up in a 3-wide set, with the third receiver in the left slot (technically the 'Y' receiver as he is on the LOS), and the 'tight end' (technically H-back) lined up on the left of the line. Dalton lines up in shotgun, with Leonard, the singleback, on his immediate right. The Browns line up in a 4-2-5 under nickel package, with the three corners playing press coverage and both safeties high. Pre-snap: Andy Dalton appears to call an audible. Hagg, the free safety, comes down into the box (dotted line in Fig 1), but Lang does not rotate to the middle of the field, and Hagg begins dropping back to his original position as the ball is snapped (solid line in Fig 1), therefore keeping the coverage unchanged - a Cover 2 shell with man coverage underneath (Robertson covering Gresham, Fort covering Leonard) with a 4-man pass rush. The play - the pass: The most obvious note about the play is that it is the result of a busted play, thanks to poor pass protection by rookie Kevin Zeitler. The play is a great example of how even QBs not known for their overt mobility can use their legs to save a busted play, as well as how useful it is to have a receiver who has good instincts, recognition and adaptability. The key parts of this phase of the play - the pass - are identified in Fig 2 by the letters A-F.
As said above, it is penetration by Rubin against Zeitler that sets this play in motion. It is easy to see why Rubin beat Zeitler - it's something that not a lot of casual fans realise, but a huge part, perhaps even the majority, of playing on the O-line has nothing to do with hand placement or upper body strength, or even leverage - it's all about footwork. If you re-watch the play, it is clear that Rubin comes free round the outside of Zeitler because Zeitler simply stops moving his feet, allowing Rubin to get off the block and chase down Dalton, marked by 'A' in Fig 2. Dalton does a good job of realising it and sprints from the pocket to his right, evading Rubin (who loses his footing trying to corral Dalton). Watching the play again, Dalton might not realise how close he was to being sacked from behind before he could throw the ball. As Dalton looks downfield, seeing Hawkins and pulling his arm back to throw, Browns DE Emmanuel Stephens is just inches away from him - yet Stephens could have been so much closer. The reason the play wasn't a sack from behind was Jermaine Gresham. Gresham eventually realises into the left flat, trailed by Robertson; but before he releases into his route, he blocks Stephens, just for a moment or two, marked by 'B'. That very brief block was enough to delay Stephens, who is unblocked once Gresham runs his route (a mistake on the part of otherwise-solid left tackle Andrew Whitworth). If Gresham had just released straight into his route, the play would have ended in a sack. So, we've addressed why Dalton was flushed from the pocket in the first place, and shown how close Dalton was to being sacked from behind thanks to Gresham's block. There is, however, a third element on the play that resulted in the avoidance of a sack, and that is some great play on the part of right tackle Andre Smith. Jabaal Sheard bursts off the line at the snap, attempting to go outside of Smith. Smith drops back slightly, as one does in pass protection, meeting Sheard while he is square to the LOS. By being square to the LOS, Smith has a much greater degree of control over Sheard, and so pushes Sheard inside, sealing him out of the play. It is because of this key, key block that Dalton even has somewhere to run - if Sheard gets outside leverage on Smith, then Dalton has to pull up short, which would have likely resulted in Stephens getting to him. Instead, Sheard is boxed inside and the right side of the field is clear for Dalton to escape to. The next element of the pass is represented at point 'D', the actions of Brian Leonard. Leonard originally appears to be looking to the left side of the line for a blitz to pick up, and is surprised when Zeitler backs into him. When the guard does, though, Leonard runs up through the hole in the O line vacated by the guard, running up past the LOS and then cutting outside toward the right sideline. Fort is responsible for Leonard in coverage - you can see Fort hesitating as to whether or not to go for Dalton as he scrambles, initially deciding after some dithering to go for Dalton. As he does so, he sees Leonard releasing downfield, and tries to turn back on himself to catch up to Leonard, falling down in the process. he gets back up and follows Leonard towards the sideline. More by accident than design, or so it appears, by doing so Leonard has actually cleared out an open sightline between Dalton and Hawkins. Yes, we finally deal with the man of the hour, Andrew Hawkins. The route that Hawkins is sent on is a pretty straightforward crossing route, but it his adjustments on the fly that get him open. As he runs his route, Dalton is of course being flushed out of the pocket away from him. What happens is that the corner covering Hawkins, Wade, appears to get slightly ahead of Hawkins, which I would guess is due to him wanting to get in on the action of potentially hitting the QB. Hawkins recognises this and pulls up short, allowing Wade to overshoot him (marked at 'E'). Dalton does a great job of seeing this and, while it's not threading a needle, he does have a limited window to get the ball to Hawkins before he is flushed so far outside that Wade could have been in position to make a play on the ball. Dalton throws the ball to a now-open Hawkins (represented by the green dashed line), who then turns with the ball and goes on to have a highlight run after the catch. The last point to be made of the pass is at point F, which sees Binns running a comeback route, bringing Patterson with him. This doesn't have much to do with the pass, but this comeback route, and specifically Binns drawing Patterson with him, opens up space along the right sideline that is instrumental in the next part of the play - what happens after the catch. The play - the catch: So, Dalton evaded the pass rush, using his feet to extend the play, and Hawkins recognised the play breaking down and adjusted accordingly to get open for Dalton's pass. Having made the catch, that would have been enough to get the first down - but Hawkins wasn't done just yet. 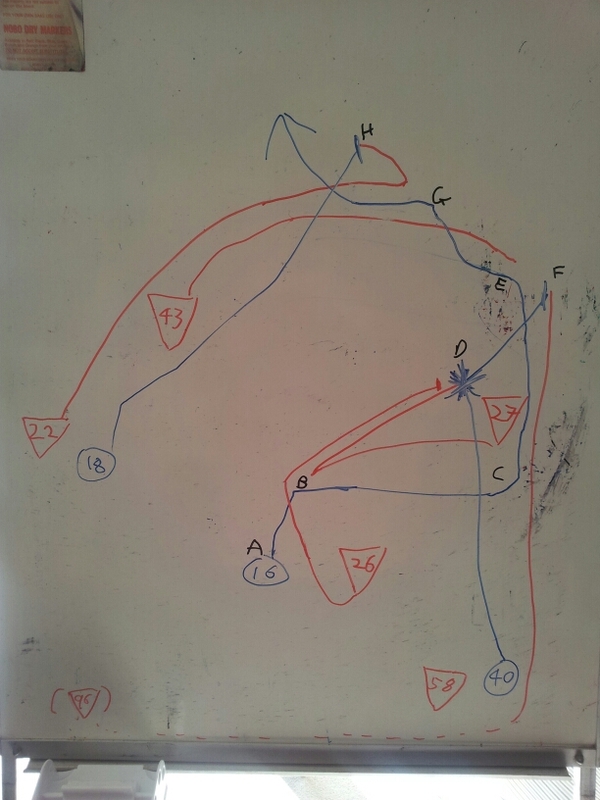 The route Hawkins takes to the endzone, plus the key actions of the other players, are marked by letters A-H in Fig 3. (For clarity's sake, I have only drawn in Fig 3 the key players in this phase of the play). A: Hawkins catches the ball and immediately turns downfield. Wade, being now a few yards away from Hawkins, has to turn back on himself and try chase Hawkins down from behind. B: The free safety, Hagg, runs towards Hawkins, staying over him (rather than making a direct beeline for him) in order to not have too shallow an angle on Hawkins should he have turned on the jets. Hawkins, seeing Hagg closing in on him, cuts very sharply to his right towards the sideline. This causes Hagg to briefly lose his footing from trying to change direction at speed, while also causing Wade to shoot past him. C: Hawkins turns downfield as he gets to the sideline, while Leonard, leaving Fort behind him, runs up inside of Hawkins as a blocker. D: This is perhaps the key block during Hawkins' run after the catch. Hagg regains his footing quickly after point 'B' and quickly chases down Hawkins. Leonard sees this and gets hands on the safety, spinning him round and then disengaging as Hagg stumbles to the ground. This block doesn't just take care of Hagg, however; Wade, who is slightly behind Hagg, runs into the safety as he goes to ground with such force that he loses his balance and likewise ends up on the floor, both DBs taken out of the play by a single block by Leonard. Leonard's not done quite yet, though. E: The strong safety, Lang, has come over the top of the play to try and stop Hawkins. Hawkins again shows how proficient he is at cutting sharply at speed without losing his balance, as a simple sharp cut inside is enough to shake Lang. F: While technically this block wouldn't really have effected the outcome of the play, I include to highlight and commend the two players. Leonard already ran downfield to be a blocker for Hawkins where some players (such as Binns, who was actually further downfield than Leonard at the catch) would stop trying on the play, making a key block to take out two defenders. Leonard still gets involved beyond that, blocking a defender to the outside who, while realistically would never have got to Hawkins, theoretically might have. It's the kind of no-quit, team-first attitude that sadly not enough NFL players display, and Leonard's effort on the play deserves to be specially mentioned. However, I also feel I have to give recognition to great hustle shown by Emmanuel Stephens. Stephens, the RDE on the play, has already run the width of the field to flush Dalton out the pocket (which technically occurred below the bottom of the whiteboard, hence him appearing in brackets in the bottom left corner); after Dalton makes the throw, he doesn't stop trying like most DL in the league would have done; rather, he sprints down the sideline to chase down Hawkins, showing phenomenal hustle for a lineman, and pretty much is level with Hawkins as he cuts inside to avoid Lang. Leonard pushes him out of bounds, so he never really threatens the receiver, but still, excellent effort from Stephens - its the kind of hustle, and refusal to give up on the play, that the Cleveland coaching staff should be pointing to as an example for the rest of the team. G: While initially at the opposite sideline, Browns corner Skrine runs across the field to try and help; showing a degree of recognition and understanding that seemingly a lot of defenders lack, he gets deep as he goes across in order to get over the top of Hawkins - far, far too many defenders try and come at ball carriers from a shallow angle, and as a result are often in a terrible position to make a tackle their target. For all that Skrine correctly gets deep, another at-speed cut from Hawkins is enough to shake Skrine. H: A.J. Green does not initially hustle towards the play, resulting in Skrine getting to Hawkins before he does. Green does, however, eventually decide to get in on the action, and though Hawkins is pretty much across the goal line at this point, he nonetheless throws a block on Skrine just in case the DB had been able to stop Hawkins from behind. So, by three at-speed cuts and one crucial blocker (and a secondary just-in-case blocker in Green), Hawkins was able to take a catch, salvaged from a busted play, and take it 40 yards for a touchdown. Thanks again to Oliver Inwards for nominating this play, and remember, we're always looking to spread the love so nominate a play this weekend and it could be your name in the blog next week! The final two Plays that Paid Off of Week 2 will be up later today so make sure to keep checking in with your favourite lineman-run blog.